Attaches nylon ties to flex duct and sheet metal take-offs. Works on all ties including thin designs. Comfortable cushion grip handles. Great product!! I replaced all of the flex-duct in our home this past weekend, and this tool did an outstanding job. I'm using it in a home environment, not professionally, so I can't speak about long-term durability. For my purposes it was excellent, and the price was great. Thanks! I have a Reem 4 ton split 10 seer that is 17 years old. I have been getting estimate on 16 seer units. Out of four contractors, only one has said there is a problem with the return and supply plenums and need to be redone. He said that the way it is you will not get good airflow and it will be very difficult to balance the system. He also said we need to add another return air grill, because my 20 by 30 grill is shy of 800 sq inches needed. I took some pictures of the plenums. I just do not know if he is right, but he did sound pretty knowledgeable. The thing is that not only are your plenums not correct, your flex duct is terribly, terribly sloppy which is cutting your airflow drastically. Flex needs to be as short as possible, it needs to be hung properly not laying all over the floor. It also needs to be pulled tight as possible, no sagging. When the air turns down it should be a metal elbow. Now your dealer is saying your return air is short. This is bad on your equipment. Its like you trying to run a race with your nose taped shut. Now the thing you need to know is that under close to ideal situation you will need 1600 cfm feeding the indoor coil and being returned to the blower. It would not be unreasonable to have the dealer you end up with show you the charts or guides that show you what size flex runs and returns will give you the 1600 cfm. I would baulk at anything lower than 1400 cfm. 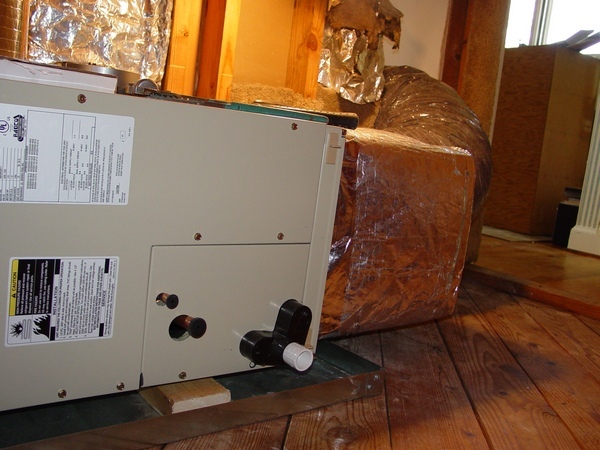 This page is dedicated to the attic ductwork installation, runing of the ductwork in chase, furnace and garage tube heater installation. You can see 71 high quality pictures that represent project in the making! So, if you would like to see all these pictures presented on the page please pay $2.00 (two dollars). Now with brief explanationsthe the page is twice as valuable! In order to gain an accesses to this page you have to pay access fee: $2.00. Just click on the “Buy Now” button below. Once you pay, you will gain an instant access to the page! After you have purchased a paid page, Pay Pal will bring you back to my website. In order to see the paid page you have to click on the “Register” button, fill out a form, chose your own Username and Password and click on the “Register” button at the bottom of the form – congratulation, you are on the page you have paid for! Important: After you have purchased any Paid page or Download page and a PayPal brought you back to my website, the first thing that you should do is to save that page to your Favorites. Then if something goes wrong you always can come back to re-register yourself on my website again. Top of the Line House Ductwork Installation page – if you are planning to build a beautiful and expensive house this page is just for you! So, if you would like to see all these pictures presented on the page, 122 of them, please pay $2.00 for the instant access to the page.